Tight on time? Stick with the 3 Key Takeaways and The Basics. These will provide your athletes with a solid foundation for understanding teamwork. Teamwork is when two or more people work together to accomplish a common goal. A team won’t make it very far if everyone doesn’t agree 1) to work together, and 2) that the name on the front of their jersey is more important than the one on the back. 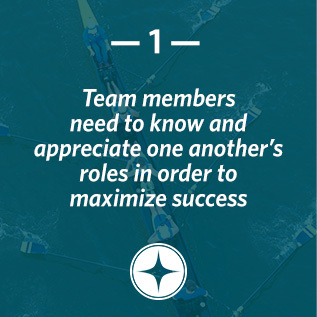 Teamwork is especially important in team sports. Teams that work together usually do better than teams that rely on just one or two players. Not only does teamwork help win games, it also helps create strong friendships with teammates that will last long after the final whistle blows. As they say, teamwork makes the dream work! 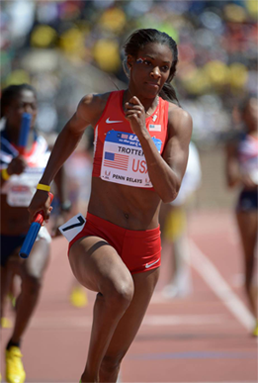 American track and field athlete DeeDee Trotter was faced with a difficult decision just moments before she was set to compete in the 4 x 400m relay at the Beijing Olympic Games. Just before she was to run as the anchor position, DeeDee, one of the fastest women in the world, began experiencing severe pain from a previous injury and was not at 100 percent. 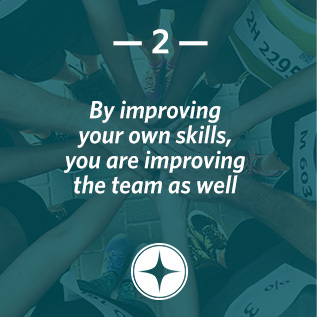 As she and her teammates began to mentally and physically prepare to run, DeeDee informed her three teammates to tell the alternate runner to warm up. Her teammates were of course surprised, but gathered together quickly to make adjustments for the relay. With DeeDee on the sideline, the team successfully advanced to the 4 x 400 meter relay finals and eventually the top of the podium, winning a gold medal for Team USA. Even though DeeDee had trained with the team and helped them to the semis, because she did not run in the final she did not receive a gold medal of her own. DeeDee’s decision to give up her spot on the team was difficult. But she knew she had to make the decision with the team in mind, and that in the end, it really did not matter who received the credit. Had DeeDee run the relay with her injured knee, she would have been putting her own interests above those of the team. Instead, she was the ultimate teammate and did what was best for Team USA. TrueSport athletes like DeeDee put their teammates above themselves and understand the importance of each other’s roles. 2. Would you have made the same sacrifice as DeeDee? 3. How can you practice being a better teammate this week or during your next season? Use this 15-minute activity to reinforce why teamwork is so important with these simple questions. This simple worksheet will test your athletes’ knowledge about what makes a good (and bad) teammate. Celebrate your group’s completion of the TrueSport Teamwork lesson with this special certificate. Sign-up to receive the Teamwork resources! Subscribe to our Newsletter to stay informed on the latest Teamwork updates. If you are a coach or parent that wants to develop well-rounded youth athletes, check out our Learn Teamwork section for all the latest articles and infographics regarding Teamwork.